General Motor’s luxury brand, Cadillac, entered into the crossover utility market with the introduction of the 2004 SRX model. The Cadillac SRX was created as a direct competitor with Mercedes-Benz M Class, the Lexus RX, and the BMW X5, and features seating for up to five passengers. 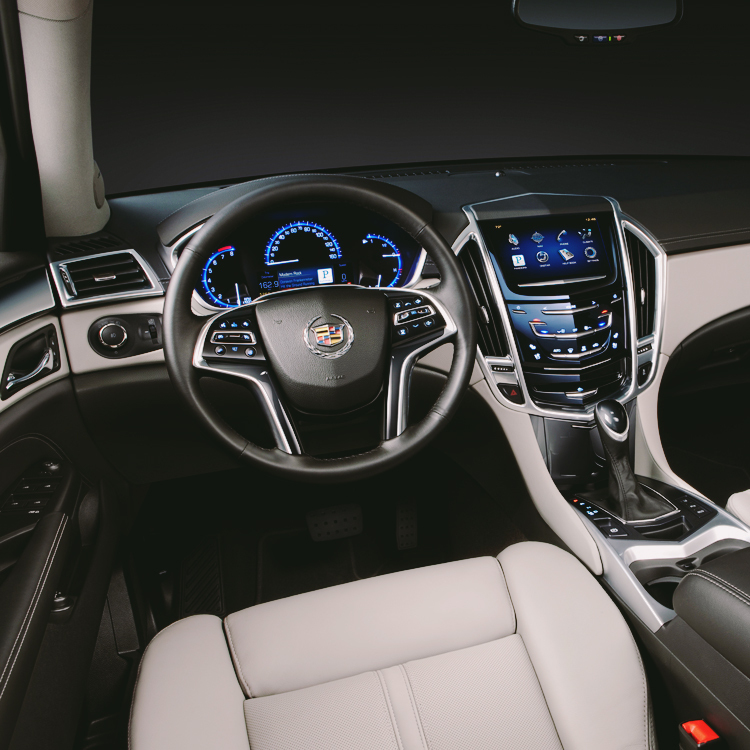 The SRX is rounding out its second generation with its 2015 model year, which offers the same standard of luxury Cadillac drivers have come to expect. While 2015 Cadillac SRX did not receive any major redesigns, it did gain a new list of standard and available features. Those who choose to purchase a new 2015 Cadillac SRX have the option of four different trim levels, with each one having its own list of standard luxury features. The SRX Luxury Collection sits just above the Base model, and offers premium amenities for a great price. One thing that sets the 2015 SRX apart from the competition, is its unique storage solutions that are built into the cabin and cargo space of the crossover. Drivers have multiple storage options when it comes to hauling large items, or storing small ones. The 2015 Cadillac SRX may not be completely redesigned, but it has gained important technological features. One of the more notable features is OnStar with 4G LTE Wi-Fi hotspot. This impressive technology comes standard on all four trim levels, and features a built-in wireless hotspot, that can accommodate up to seven mobile devices at one time. Regardless of where the road takes you, you and your passengers will stay connected on the go. To further aid in connectivity on the go, Cadillac offers its Cadillac CUE information and media control system, as standard technology on all four trim levels. CUE allows drivers to connect to their smartphone or tablet, via an 8-inch color touchscreen, safely while driving. Its uncluttered design features natural voice recognition, and a responsive touch-screen technology. CUE is an easy to use technology, that is more advanced than anything else on the road today. Proximity Sensing: This industry-first technology displays information in a clean, organized fashion. Icons that are not in use fade into the background while driving, and appear again when your hand approaches the screen. Haptic Feedback: Another industry-first, the CUE gives drivers a tactile pulse, or vibration, through the screen when a touch-screen button is pushed. Drivers can confidently keep their eyes on the road, knowing that their task was completed. Natural Voice Recognition: Easily control your navigation, phone, or music, with this industry-first advanced technology. The CUE system does not come with a booklet of commands, but rather allows drivers to communicate in a conversational tone, making CUE easier to interact with, and more responsive. The 2015 SRX features incredibly advanced, in-vehicle technology, that comes standard on all trim levels. Cadillac is certainly raising the bar with its SRX crossover. Owning a luxury Cadillac crossover doesn’t have to break the bank. The middle of the road Luxury model, makes owning a Cadillac SRX both practical, and possible. Starting at just $43,640, the Luxury model comes standard with impressive features, luxury amenities, and the incredible quality Cadillac drivers have come to expect. Check out what the 2015 SRX Luxury model includes below, that the base Standard model leaves out. With the base Standard model starting at $37,605, drivers who choose the Luxury model will be happy with the long list of extra features they will enjoy, for a small increase in the vehicle’s overall MSRP. The 2015 SRX Luxury includes many other standard features and amenities that are also offered on the base Standard model, such as CUE technology, dual zone automatic climate control, Bose premium 8-speaker sound system, and OnStar with 4G LTE. The SRX seats five passengers comfortably, with plenty of extra space for personal belongings, and even luggage. The interior of the SRX was specifically designed with practicality, and functionality in mind. There are many components worked into the 2015 SRX that help drivers stay organized, and store plenty of cargo. Power Liftgate: Easily access your rear cargo space with the simple push of a button on the available power liftgate. Drivers who park in a garage with low ceilings, will appreciate the memory settings that let you program the height that the liftgate will stop at. 60/40 Split Rear Seat: The SRX features options for hauling cargo. The rear bench seat folds down in multiple configurations, for a maximum cargo capacity of just over 60 cubic feet. Integrated Roof Rails: These sleek roof rails come standard on all SRX models, adding to the aesthetic appeal of the SRX. Drivers who want to utilize additional cargo space, can add available cross rails. Underfloor Storage Bin: This deep bin is nestled into the floor of the rear cargo area. Keep valuables out of view, and add extra cargo capacity with this unique storage solution. When opened, the hooks on the underside of the cover can be used to hang shopping bags. Cargo Management System: An intelligent U-Rail system is integrated into the floor of the SRX, and a cargo fence attaches to help keep valuables and luggage where you intend them to stay. The cargo fence also comes with a cargo shade that is retractable . and can be used to cover the cargo area. Cooled Glove Box: Keep items chilled on the go, with this unique storage solution.